PARENTING PLANS: MEETING THE CHALLENGES WITH FACTS AND ANALYSIS by Dr. Daniel Hynan has been published by the American Bar Association. It is easy and quick to find specific parenting plan information in this book. The Table of Contents is set up like the information below to clearly identify both exact sections and major topics. Bullet point summaries at the end of each chapter efficiently highlight crucial contents. Find your desired parenting plan tool or learn about a general issue. Or do both, depending on what you need at the time. Too often, lawyers, judges, and mental health experts approach parenting plans as a routine, cookie-cutter exercise—either every other weekend or 50/50. In his new ABA-published book, Parenting Plans: Meeting the Challenges with Facts and Analysis, Dr. Daniel Hynan charts a more sensible approach. Drawing from psychology’s literature, his expertise in the interview and testing elements of child custody evaluations, and his broad experience working with children and families of divorce, Dr. Hynan shows how to craft workable schedules that can meet children’s needs and help families move forward after the case ends. Parenting Plans fairly discusses the psychological literature of several key, often contentious, issues that complicate cases. Summary points at the end of each chapter provide a convenient synopsis of the chapter’s key issues and useful tools to sharpen deposition or examination questions of experts. And the book’s last chapter discusses, with examples and calendars, the rationales of various age-appropriate parenting plans that lawyers and judges may consider. Whether your case is in litigation, mediation, or settlement talks, Parenting Plans is a valuable resource for lawyers and judges when they consider parenting schedules that will meet the children’s best interests. Get it. Author, Confronting Mental Health Evidence: A Practical PLAN to Examine Experts and Reliability in Family Law, 2nd Ed. The highest praises an expert evaluator can hear are that their work is balanced, nuanced, and thorough. This book earns these descriptors! Hynan organizes around the parenting plan task and demonstrates how social policy and scientific research inform decisions about the numerous practical problems evaluators face. Hynan has the ability to navigate complex issues that complicate cases and the acumen to systematically view things individually, when necessary, or in combination, when reality requires it. This book provides extraordinary insight into the evaluator’s conceptual tools and the analytic processes the best experts must master. Invaluable as a guide and reference book for those who are (or wish to be) sophisticated evaluators! 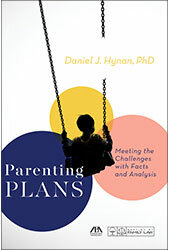 In his book, Parenting Plans: Meeting the Challenges with Facts and Analysis, Dr. Daniel Hynan keenly observes how bias, confusion and misinformation often contaminate child custody matters. As a practicing lawyer and long- time observer of how family court judges wield King Solomon’s sword, I welcome Dr. Hynan’s clinical insights and the science he brings to this emotional subject. The information is particularly timely considering the national debate on the propriety of shared child custody. I will never approach another child placement matter without this well researched reference book in hand. It should be a regular resource for lawyers, child representatives and family court judges everywhere.